Dugong, seagrass and community-based management experts met in Bangkok from 25 to 27 January 2017 to finalise the content of the TOTAL, Total Abu Al Bukhoosh, Environment Agency – Abu Dhabi (EAD) and CMS Dugong MOU Dugong and Seagrass Research Toolkit and provide guidance on upcoming CMS Dugong MOU events including the Third Meeting of Signatories (MOS3) to the Dugong MOU, and the Seagrass and Dugong Technical Workshop. 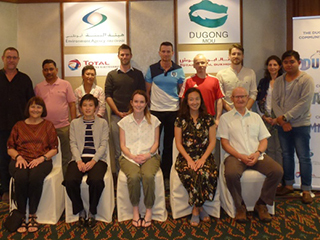 The Technical Advisors to Dugong MOU (Dugong Technical Group), along with representatives from EAD, GEF-5 Dugong and Seagrass Conservation Project, Intex Design and the Dugong MOU Secretariat, attended the meeting and spent two days developing and refining the Dugong and Seagrass Research Toolkit ahead of its launch in March 2017. The Dugong and Seagrass Research Toolkit is an easily accessible online resource that incorporates decision-making for the selection of the most appropriate methodologies for studies of dugongs, seagrasses and the associated human communities, and has the potential to make a significant contribution to dugong and seagrass conservation across the dugongs’ range. On the third day of the meeting the experts discussed MOS3 and planned the Seagrass and Dugong Technical Workshop. Presentations were also given on the CMS Dugong MOU Trang Incentive Projectand the GEF-5 Dugong and Seagrass Conservation Project. The Dugong MOU Secretariat gratefully acknowledges the financial support of EAD and logistical support from Marine Research Foundation to co-host this meeting.